The impressive Roman fort at Burgh Castle, near Great Yarmouth, close to the River Waveney and overlooking the Halvergate Marshes. The walls of the fort are in the care of English Heritage, but the Trust owns the fort, most of the surrounding farmland and an adjacent area of reed beds, which are full of interesting bird life. The property in all covers 90 acres (37 hectares). 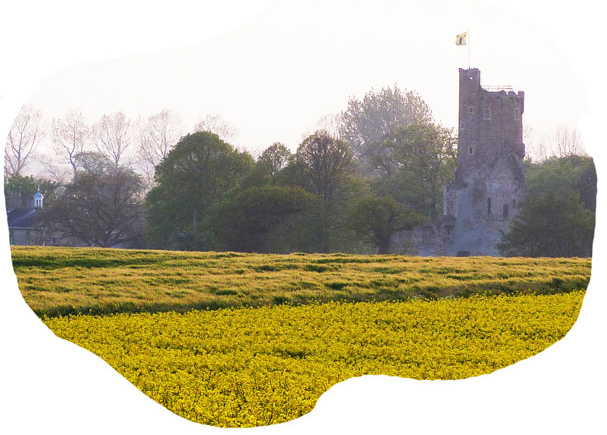 Caister Castle was built in 1432 by Sir John Fastolf. The 90 foot tower remains intact and visitors can climb to the top for a magnificent view of the castle ruins and the surrounding area. The castle is of historical interest both because it is one of earliest buildings in England of importance to be built of brick and because of its connection with Fastolf and later the Paston family.The Castle is currently home to the largest private collection of motor vehicles in Britain which is housed in a purpose built museum and includes many fine and rare veteran, vintage, classic, sports and touring automobiles and motorcycles. The partial excavated remains of a Roman ‘Saxon Shore’ fort, including wall and ditch sections and building foundations. Built around AD 200 for a unit of the Roman army and navy and occupied until the end of the 4th century. The Roman capital of East Anglia, or more precisely the capital of the area of the Iceni tribe led by the famous Queen Boudicca. After her rebellion was over, the Romans laid out the foundations of their new regional capital in a bend of the River Tas and called it Venta Icenorum – “the market place of the Iceni”. One of the earliest purpose-built artillery blockhouses in England, Cow Tower was built in 1398-9 to control a strategic point in Norwich’s city defences. A Medieval tower on the North Quay, Gt Yarmouth, built in 1344 as part of the town walls. An interesting link for this part of the town can be found here. Dates from 1490, with a hammer beam roof, and a panel on the rood screen depicting William of Norwich, a boy martyr said to have been crucified by Jews in the 12th century. The Abbey of St Benets lies on a sand and gravel island called Cow Holm surrounded by grazingmarshes beside the River Bure. The site was enclosed by a wall with battlements in 1327. It was the only religious house in England not actually dissolved by Henry VIII. The Bishops of Norwich have remained Abbots to the present time. The Bishop/Abbot arrives by wherry and preaches at the annual service on the first Sunday during August. In 1987, a cross of oak from the Royal Estate at Sandringham was erected on the site of the High Altar. Dates from 1370, and has an outstanding painted rood screen. There is a wonderful antiphoner book of 285 sheepskin pages with versicles and responses for the seven services for every day of the year, produced by monks of Langley Abbey and given to the church in 1748. Splendid views of broadland can be seen from the top of the 96 ft (29 m) high tower. The hidden gem in this unassuming ruin is its 14th century refectory undercroft. Its vaulted brick ceiling is an important early example of the use of brick in England. Supported on Purbeck marble columns, it is still almost complete and retains much of its original plasterwork. Somerleyton Hall is widely regarded as one of the best examples of an archetypal Tudor-Jacobean mansion and one of the most beautiful stately homes in Britain whose rooms and gardens are open to the public.